My father always told me, much to my annoyance, that a photo without a human subject was at best boring, at worst worthless. This point of view used to frustrate me considerably because I love photographs of architecture and landscapes. As a journalist, my father has a long-ingrained inclination to see that the story is always in the people, rather than things or places alone, and thus, understandably, in his eyes, a photo without people has no narrative. The question I would posit is whether it is really necessary for a photograph to have a narrative to be appreciated. I don’t believe so, though, as any glance through the photos so far selected in this series will show, I have ultimately come to prefer photographs with human subjects, precisely because they have a more narrative element. There is, however, plenty of room for enjoying the purely decorative. This shot was taken from Munduk in Bali in 2009 and is a view across the north west of Bali to what I believe is Gunung Merapi on the island of Java. 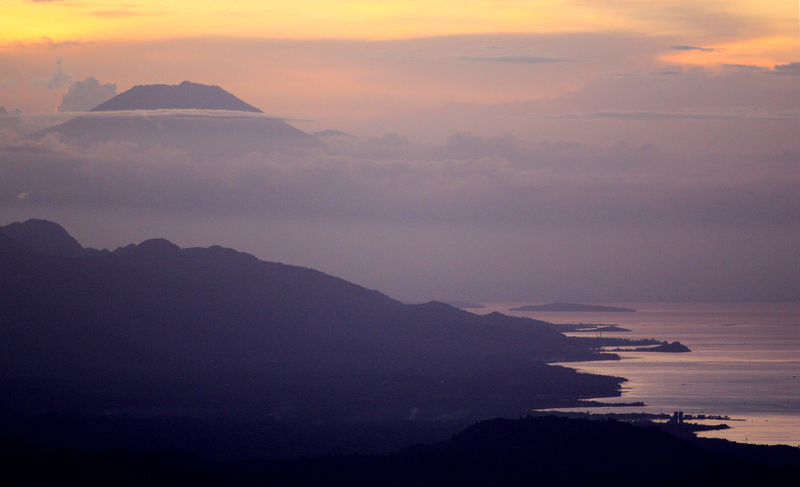 Munduk is at the relatively low elevation of 900 metres, in the foothills of Mt Kintamani, but due to the tapered land along the northern coast, it commands a view right across to the volcanoes of eastern Java. This is taken with my 200 mm lens, which cuts out much of the land before the coast, giving Munduk the deceptive feeling of being much closer to the sea. I took this photo in the early evening, while my brother and I sat on the porch of a bungalow in Puri Lumbung Cottages drinking coffee. We sat there for hours, ultimately around the flame of a small kerosene lamp with a roundel portrait of Barbie affixed to disperse the light. There are almost 300 shots of this view taken with various exposures, shifts of focus, different cloud cover, varied light – but this one stood out to me somehow as the most striking. There is something fantastical about the volcano’s separation from the rest of the shot behind a ball gown of cloud. The mountain’s monumentality contrasts with the intricacy of the coast and its more delicate, finicky appendages. The exotic otherworldliness of the scene is enhanced by the wash of purple light, which, rather than aligning this with thoughts of lost worlds and south seas, inclines me to think of science fiction impressions of other planets. That this scene is indeed on planet Earth is a very pleasing thought on which to finish. Good thing you were not influenced by his opinion, this is a Beautiful photo! My parents still tell me the same thing about photos without people in them. I love photos of places and things, it makes me imagine and think about the history behind them. Thanks, yes, I guess it all comes down to what you imagine a photo is for. I completely understand the innately anthropomorphic urge only to perceive things in relation to humans, for the sake I suppose of either scale or relevance, but I do like to think outside humans as much as possible, though, irrespective of that, the evidence of humans is so present in this photo that it serves the same function of relativity.